Get your tickets this movie is already setting box office records. 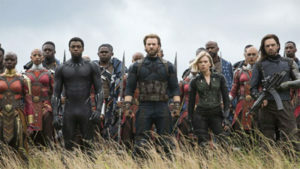 Deadline.com reports that this opening weekend the movie broke the all-time record by doing over $250 million in domestic sales! More than two months since “Black Panther” smashed all expectations about comic book films, Marvel unleashed this party of magnet superstars. Open with the Black Panther (Chadwick Boseman), Iron Man (Robert Downey Jr.), Captain America (Chris Evans), Scarlet Witch (Elizabeth Olsen), Doctor Strange (Benedict Cumberbatch), Thor (Chris Hemsworth), Gamora (Zoe Saldana), and Spider-Man (Tom Holland). Now that is how you throw a party! Marvel was prescient in their placement of the “Black Panther” movie prior to this release. After that huge success, they had scripted this movie to center on a battle not in New York, but Wakanda. If you recall at the end of that movie that movie Bozman’s character goes to the U.N. to announce that Wakanda was going to share their secrets with the world. Yes, all the Nubian women warriors are in the movie. Plus you will love the scenes where T’chala’s sister Shuri “schools” Tony Stark, billionaire genius, on the finer points. To enjoy the movie you will have to get up to speed on the plot line. Consider, trying to enjoy the last episode of “Empire” or “The Keepers” without knowing the back story. Trust me you will be scratching your head if you have not kept up. This movie is directed by the Russo brothers, the architects be-hind Captain America: Civil War, Captain America: Winter Soldier and Infinity War. This time they, dare to ask what happens if saving the day means taking real, tangible losses — a concept so foreign that it comes in the form of an intergalactic purple titan named Thanos (Josh Brolin). The problem with this c.g.i. created protagonist is they made him appear laughable. Good news this is probably the only flaw in this great flick! This amalgam was 18 pictures in the making, but wow they nailed it big time. Every persona in this all-star galaxy of superheroes gets their time to shine. The Russo’s left nobody behind in the movie. At 2 hours and 40 minutes it takes time to get them all in. It is still a great watch and don’t leave when the credits roll…..